Confused about the relationship between the U.K., England, and Great Britain? Want a better understanding of the U.K.’s connection with Ireland, Scotland, and Wales? Curious why so many other countries still have the Queen’s face on their currency? Not quite sure what The Commonwealth is? The Brexit referendum, set for June 23rd, will determine whether the U.K. stays or leaves the European Union. And all of the places mentioned above have a direct role in the vote. If you’re unsure what these places are or how they relate to the United Kingdom, keep calm and read on (ouch!). Or, you can just skip ahead to the last chart, which sums it all up. Between its highly unusual structure and lots of ambiguously named places, the British Isles are a confusing place. I think the piece that trips most people up is the idea of a country within a country. The United Kingdom, a country, is made up of four separate countries: England, Scotland, Wales, and Northern Ireland. “Country” is normally used interchangeably with “sovereign state,” and in most cases they are the same, but not always. Sovereign state is an official, well-defined term. It is what most people really mean when they say country. It refers to the highest level of world government, the one that has the final say over what happens within its borders. And though there are some disputes over the sovereignty of particular territories, the U.N. serves as a common point of reference for a list of the world’s sovereign states. “Country,” on the other hand, is much more vague. The term has no agreed definition, and different governments use it to refer to different things. If the decision were up to another government, England, Scotland, Wales, and Northern Ireland might instead be considered provinces or regions, since they do not have sovereignty over their lands (only the United Kingdom does). I suppose because of their distinct cultures and historical independence, the U.K. decided to regard them each as countries. Beyond the four countries, the U.K. also has sovereignty over the three Crown Dependencies (the Isle of Man, Jersey, and Guernsey). However, as independent jurisdictions they are not part of the United Kingdom. The Queen serves as the islands’ head of state, but not technically as their queen. In the Isle of Man, her title is Lord of Mann and in the Channel Islands, she has no specific title. To top off the confusion, many of the places are similarly named. Four of the regions have “Britain” or “British” in their name. 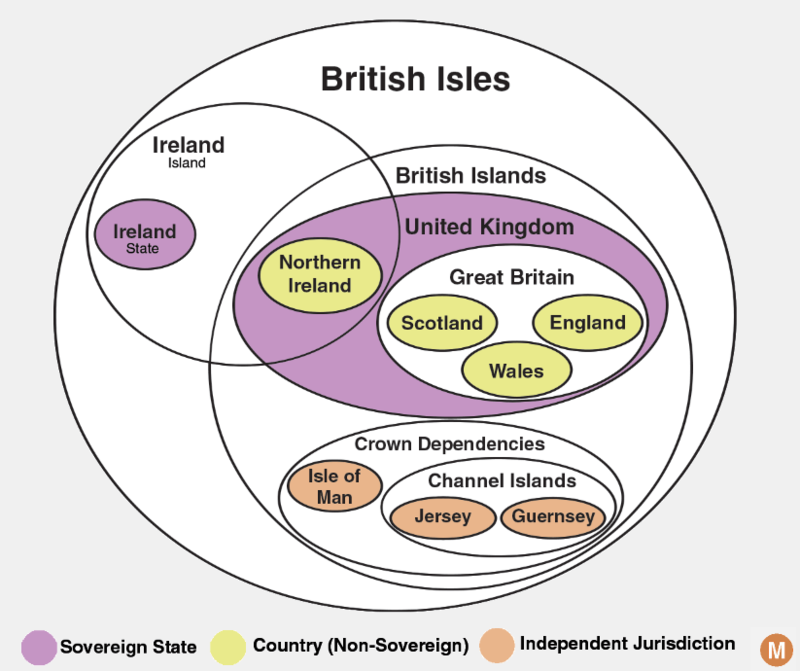 The British Isles, The British Islands, Great Britain, and Britain all have different meanings (“Britain” is not shown in the diagram, but it is an alternate name for the United Kingdom). “Ireland” appears three times: Northern Ireland (the country within the U.K.), Ireland (the Republic of Ireland, an entirely separate sovereign nation), and Ireland (the island they both occupy). In the same way that the United States government has sovereignty over Puerto Rico, Guam and other territories beyond the 50 states, the United Kingdom’s sovereignty also extends to other territories beyond its borders. 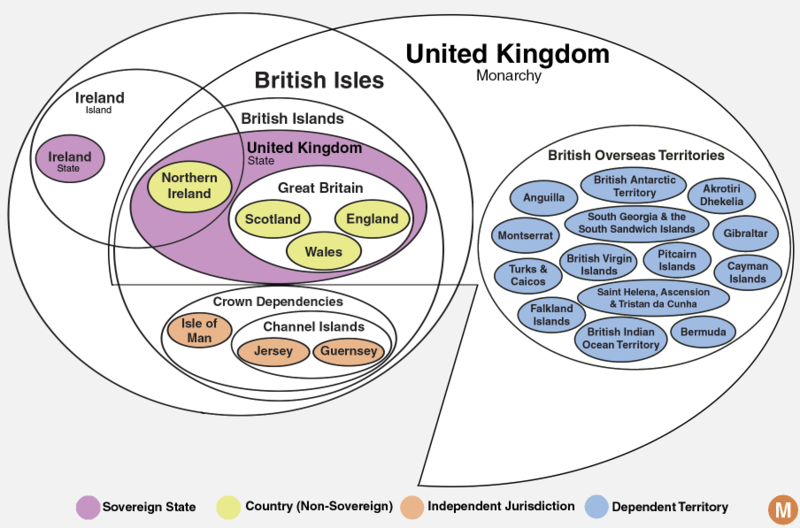 The 14 Overseas Territories in the diagram are the last remnants of the British Empire, former colonies that never claimed their independence or decided to remain under the umbrella of the U.K. They all belong to the constitutional monarchy of the United Kingdom and recognize the queen as their monarch and head of state. 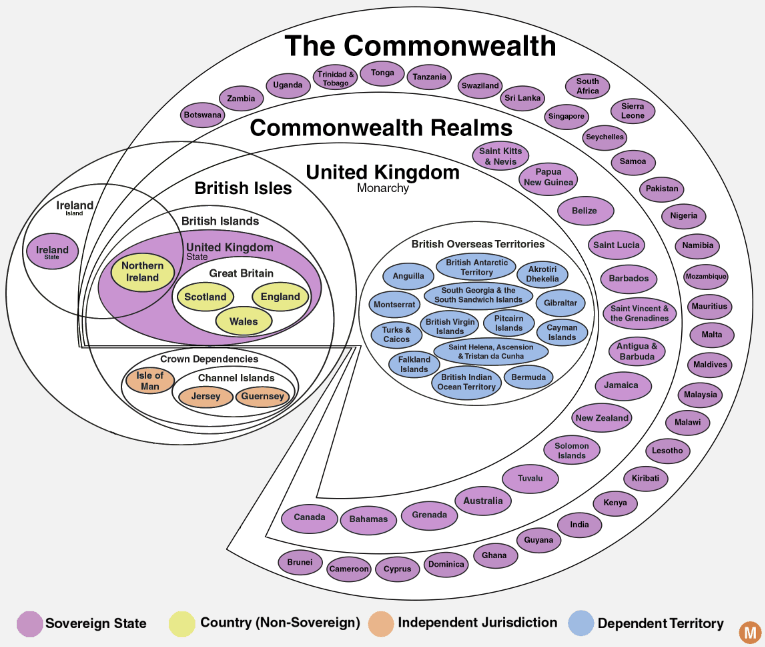 Separate from her role as Monarch of the United Kingdom, the Queen is also Queen of Canada, Queen of Australia, Queen of Jamaica, and Queen of the other 12 other sovereign states shown in the chart, known as Commonwealth Realms. Many of the countries have the Queen’s face on their currencies and several incorporate the Union Jack into their own flags, but the Royal Family has only a minor ceremonial role in their governments. Though the queen is technically head of state for all of the Commonwealth Realms, in practice the head of state functions are carried out by official representatives, who each Realm nominates for itself. Contrary to any criticisms you may have heard about the royal family soaking their former colonies for taxes, the Commonwealth Realms are not required to pay any money to the U.K. or to its royal family. The Commonwealth is the last remaining connection between the U.K. and [most of] its former colonies, which together make up about a third of the world’s population. The concept of the Commonwealth came into being shortly after colonies began declaring independence while retaining the U.K.’s monarch as the head of state. It described the changing British Empire, which now included independent countries. Since then it has gradually evolved into a voluntary intergovernmental organization in which all members are equal. Two of its members (Rwanda and Mozambique) don’t even have any historical ties to the British Empire. The Queen remains the ceremonial Head of the Commonwealth, but the U.K. no longer has any special role in the organization’s governance. Who is eligible to vote in the Brexit referendum? The vote is open to U.K., Commonwealth, and Irish citizens who live in the United Kingdom. U.K. citizenship includes everyone from the Monarchy of the United Kingdom as well as citizens of the Crown Dependencies (even though they are not technically part of the U.K.). Yes, citizens of India, Canada, Namibia, and all the other Commonwealth countries can vote, as long as they live in the U.K.
You may be surprised to learn citizens of Ireland (the Republic of Ireland, not Northern Ireland) are eligible to vote. Under British law, Commonwealth and Irish citizens are treated as a special class. They have fewer rights than U.K. citizens, but more than other foreign nationals, such as the right to vote. This means citizens of all the places shown in the final chart (about one-third of the world’s population) are eligible to vote, so long as they live in the United Kingdom. The vote is also open to Commonwealth Citizens living in Gibraltar and U.K. nationals who live abroad (full description of voter eligibility). 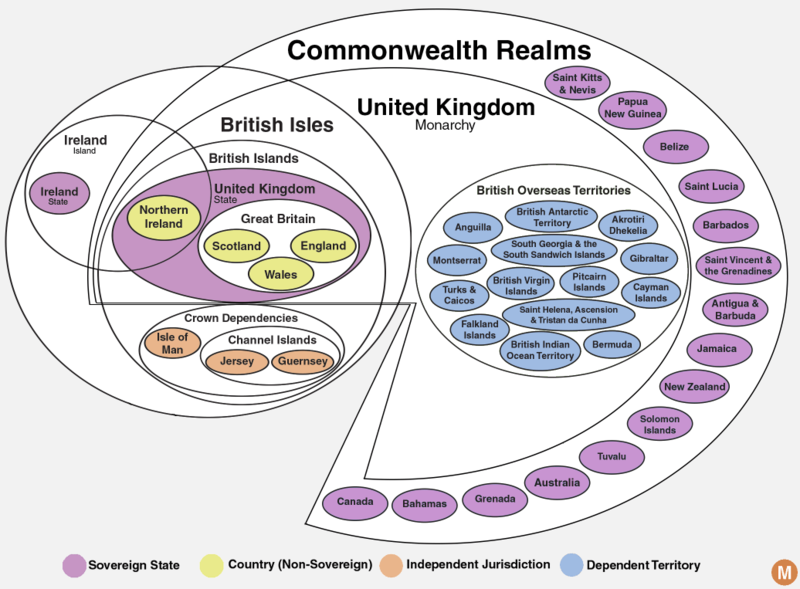 If you were at all confused about Great Britain, England, the U.K., Scotland, Ireland, Wales, the Commonwealth, or any associated territories, dependencies, monarchies, realms, states, jurisdictions, or former colonies, hopefully these charts helped clear it up. If not, try to keep a stiff upper lip (ouch!). Credit to TWCarlson for his Euler diagram on which the ones here are based. You’re right. What I was referring to is the first use of the term / origin of the concept, but I butchered the phrasing. Thanks for calling it out! IIRC, Benjamin Franklin proposed a Commonwealth-style relationship with Britain, but ultimately accepted full independence as being a better option than the status quo of the time. IF Benjamin Franklin’s proposal had been adopted, the Stamp Act of 1865 been withdrawn and/or tensions in 1765-1775 been handled better by both sides world history would have been very different. If the 13 Colonies remained British would the French Revolution have still happened? Would the southern colonies have declared civil war on the northern colonies around 1799 in order to protect their slave-based industry… and won? Are you sure that Jersey and Guernsey (and Sark and the others) are geographically part of the British Isles? I thought the Channel Islands were a separate geographical entity – they’re close to the French coast and not part of the British archipelago. Agree that geographically they do not look like they should be included. This of course underlines your point that it’s all absurdly confusing! On the Isle of Man, she is Queen; “Lord of Mann” is a subsidiary title that people other than monarchs have held, but which has been subordinate to English (later British) sovereignty since the Middle Ages. In Jersey and Guernsey, she is Queen, with some informally and unofficially calling her Duke of Normandy.